PhD in industrial design with focus on emerging practices and gender studies in Umea. Application materials shall be submitted not later than on March 8, 2019 at 16:00 to the Personnel Department of the Estonian Academy of Arts (room D207, Põhja pst 7, 10412 Tallinn) or in digitally signed format to the e-mail address personal@artun.ee with the title „Competition“. Open post in HDK. More here! Open post at AHO. More here! Umeå Institute of Design is now looking for one or two Senior Lecturers on artistic foundation in design, with specialization towards user-centered design. The employments are part-time substitute positions (can be extended from 25% to 50 %), for the period of January to June, 2018 (starting date upon agreement). The last day to apply is 2017-12-31. The employment as substitute Senior Lecturer includes teaching and tutoring within basic and advanced level education: single subject courses, the Bachelor Programme in Industrial Design, the Master Programme in Interaction Design and the one-year course Industrial Design Intensive. You will be responsible for planning and teaching in collaboration with programme directors, teachers and other staff. The employment includes administration, planning, documentation and development relating to your own teaching, as well as departmental work. 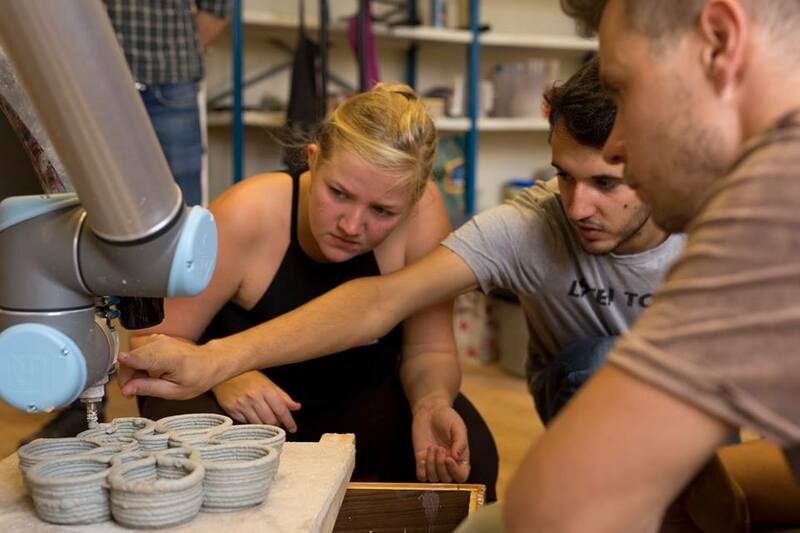 Subject development within industrial design – artistic, professional and educational – is a part of the employment, as well as contributing to the development of Umeå Institute of Design. have demonstrated artistic expertise or have some other professional expertise that is of value in view of the subject matter of the post and the duties it will involve. We are looking for a candidate with a thorough experience in the industrial design profession, with established practice in user-centered design specialized towards industrial design, interaction design and/or service design. In your profession, you are specialized towards collaborative processes, and your work cuts across design practice/profession, artistic practices and design education. You have experience in design education, with a university degree in design, pedagogical training within higher education or equivalent knowledge, and you demonstrate an ability to plan and teach within higher education. You have documented experience of different kinds of teaching, for example studio-based teaching within the area of user-centered industrial design. Experience in teaching and tutoring, as well as ability to support learning in higher education, is a requirement. You have a good ability to reflect on design education – teaching as well as learning – in relation to developments within the area of design, and in relation to a societal context. Experience of artistic development work in relation to contemporary design practices, good ability to reflect over the relationship between these and over changes and development within the area of design, is a merit. You apply through Umeå University’s webpage (type ‘design’ in the search field and you will find the ad). Last day to apply is 2017-12-31. A short statement of work within user centered design practices of importance for the employment -Description of, and critical reflection on, educational activities. This should be done in accordance with the template for teaching portfolio. See instructions in appendix 4, Appointments procedure for teachers at Umeå University. In our work of achieving diversity, we are focusing especially on increasing the number of employees with a foreign background and we strive to achieve a balance between women and men in all occupational categories. We therefore look forward to women, and with another background than Swedish, to apply for the employment. Aalto University is a community of bold thinkers in the fields of technology, business, art and design. We are committed to identifying and solving grand societal challenges and building an innovative future. Aalto University has six schools with nearly 20 000 students and 4 700 employees, more than 400 of which are professors. Our schools rank among the top universities in the world. The University campuses are located in Espoo and Helsinki, Finland. The position is fixed-term for three years. The starting date is January 1, 2018, or appropriate. The professor will work in the creative and internationally recognized environment of Aalto University’s School of ARTS. The position serves the Center for General Studies (YoYo), at the Department of Art (http://taide.aalto.fi/en/) which is known for nationally and internationally recognized high quality artistic and art pedagogical activities and research. YoYo currently provides compulsory arts courses for all ARTS bachelor students, as well as elective courses in contemporary and visual art, and art theory and history for all Aalto ARTS students (doctor, master and bachelor). Although the Professor of Foundation and General Studies is situated in the Department of Art s/he will work with all five departments in ARTS, including the Departments of Design, Architecture, Media, and Film, Television, and Scenography. The professor will provide leadership to direct, oversee, review, develop, and implement compulsory/foundational arts studies and general studies for Aalto ARTS. The professor will work directly with all stakeholders, including students, faculty, and ARTS and Aalto University leadership to develop and improve planning, communication, and outreach. University-Wide Art Studies (http://uwas.aalto.fi), and other Aalto-wide studies and initiatives. The management includes the day-to-day running of the studies, including curricular planning, study programming, space management, fiscal and employee matters, and communication outreach. The professor would work with different groups to address the question of what constitutes foundational and general studies for all ARTS students, now and in the future, and how it is best provided in relation to the wider university and society. The professor is expected to have a proven track record of strong contribution in the field of foundation and general art studies in higher education. The applicants will be reviewed based on their academic leadership, artistic work and research, teaching, and activity overseeing or managing foundation or similar studies. The professor shall have capability to work broadly with the all ARTS fields and disciplines, and competence areas within those fields. · Strong written and verbal communication skills in English (familiarity with Finnish and/or Swedish language may be beneficial). Salary is internationally competitive and Aalto University provides health care and retirement benefits. Finland is a great and safe context for family, offering many excellent state-subsidized services, including affordable day care and free schools, which are consistently ranked among the best in the world. 6. The names and contact information of two to four references For a full list of materials required for the application (criteria 2-4 above) please see http://www.aalto.fi/en/about/careers/tenure_track/for_applicant/ . All application materials should be submitted in English as PDF files and are to be addressed to the Dean of Aalto ARTS. The application material will not be returned. Aalto University web site (http://www.aalto.fi/en/about/careers/jobs/view/1392/). Aalto University may perform a publication analysis of the applicants’ scientific publications based on the applicant’s CV and list of publications unless the applicant declines the analysis. based on information available on public databases. From amongst the applicants in the first phase, Aalto University will select those who will be asked to supplement their application materials. Supplemented applications are submitted for review by external experts during the second phase of the application process. guidelines for compiling CV are given at: www.aalto.fi/en/tenure_track/for_applicant. questions, you may contact HR Coordinator Anu Roine, email firstname.lastname@aalto.fi. Aalto University School of Arts, Design and Architecture is one of the most prestigious international universities of art, design and architecture in the world. The school is a strong source of social influence. Key areas of research are design, digital media, audiovisual representation, art, visual culture, well-being architecture and emerging technologies, and urban planning and design. The school’s history dates back to 1871. The Department of Media http://media.aalto.fi/en/ is an academic community of approximately 500 students and 50 faculty members created through a restructuring of the School in January 2010. The department has 9 Professors and 11 lecturers. The department conducts research and provides education in bachelor, masters and doctoral programmes across a broad range of subjects and themes. Since 2010 the study programmes and research of the department have been organized within three units: The Media Lab (New Media), Visual Communication Design and Photography. The current majors in Visual Communication Design are Information Design and Visual Narrative. The position will begin during the academic year 2017-18. The role of graphic designers has swiftly changed from producing static visual representations to collaborating in dynamic, interactive and iterative projects. Contemporary visual designers need visual and artistic sensibility, but also awareness of, and skills in, digital production methods, as well as openness to multidisciplinary approaches. The Department of Media is looking for an assistant professor with a strong professional design portfolio in graphic/communication design and experience of teaching in university-level education. In general, the Department of Media offers a dynamic academic art & design-based community with rich potential and resources for higher education and research within the broad field of Visual Communication Design. The person chosen for this position is expected to lead the future development of MA/BA studies in Visual Communication Design. Deadlines September 1 and September 15.